Hisanori Takahashi envisioned himself as a starting pitcher in the major leagues, as he had done for most of his 10-year career with the Yomiuri Giants. So what will happen after this season, when Takahashi can become a free agent and potentially has an opportunity to find an organization that will let him pitch in his preferred role? Hisanori Takahashi, pointing to catcher Henry Blanco after producing his fourth save Tuesday, has the right to be a free agent after the season. “Honestly, right now, I don’t have much to say about my future plans,” Takahashi said through an interpreter after retiring Ivan Rodriguez on a game-ending double play and notching his fourth save as the Mets beat the Nationals, 4-1, on Tuesday night. Even though the 35-year-old Takahashi signed a minor league deal with the Mets on the eve of spring training, the organization allowed a stipulation for him to be a free agent after an exclusive October negotiating window with the Mets. Normally, a player would need to have six years of major league service time before becoming a free agent. 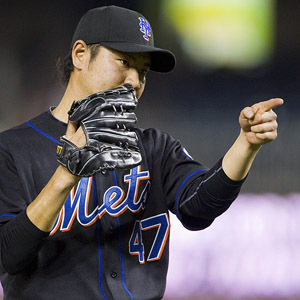 Takahashi has made 12 starts for the Mets this season, going 4-4 with a 5.01 ERA. Opposing batters hit .229 against him the first time they faced him in a game as a starting pitcher. The average jumped to .293 in the second plate appearance in a game and .381 in the third plate appearance and beyond, lending to the suggestion that Takahashi is better suited for relief in the majors. Conceivably, the Mets could offer Takahashi an opportunity to be in a fifth starter’s competition with Jenrry Mejia, Dillon Gee and whatever low-cost veteran options are brought in on unguaranteed deals for spring training -- with a pledge that no high-priced starter would be signed. The Mets do have a working relationship with Takahashi’s agents, New York-based Peter and Ed Greenberg, who also represent Johan Santana and Jose Reyes. Pedro Feliciano, the other top left-hander in the Mets bullpen, also can be a free agent after this season. He did add that New York is a plus. Takahashi added that he does want to pitch the remainder of his career in Major League Baseball. “I hope I can finish my career in the United States,” Takahashi said.